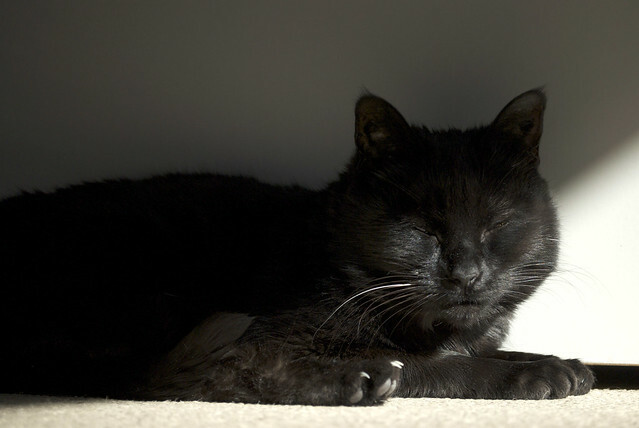 I was minding my own business, having a nap in the sun in mum's wardrobe, when the pupparazzi showed up. So I poked my tongue out at them. My new friend Boomer gave me this award during the week. It's called the Versatile Blogger Award. Thanks Boomer! Pass it on to 15 other bloggers. Well you know I can't choose so everyone who visits today must share in this award. 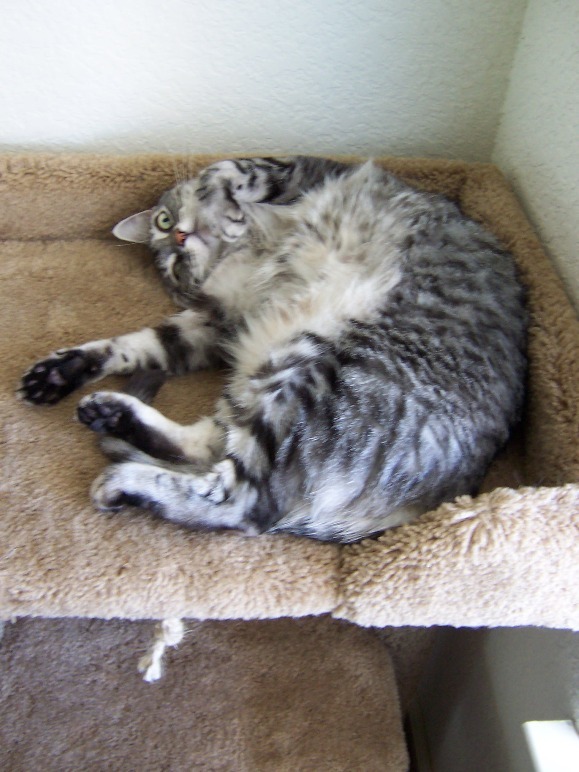 Oh, excuse me, you caught me mid-roll. I hope you all have a wonderful weekend! Mum has decided that we are going to reduce my blogging schedule. She says I hardly do anything at this time of the year anyway (because it's so cold and miserable outside) and I refuse to pose for photos a lot of the time, so I am only going to be posting every second day. 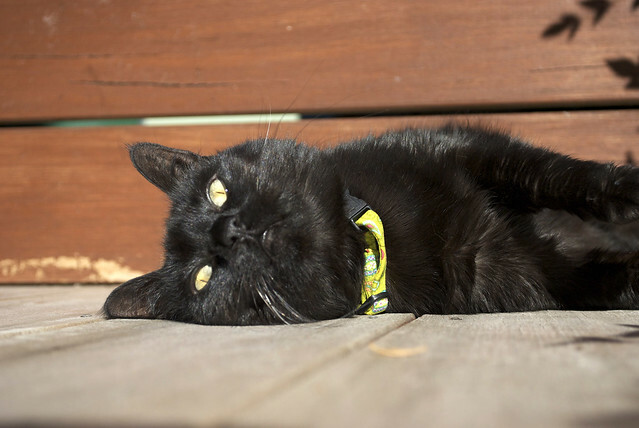 This is me lying around on the deck in the sun. I have three favourite places to take naps. 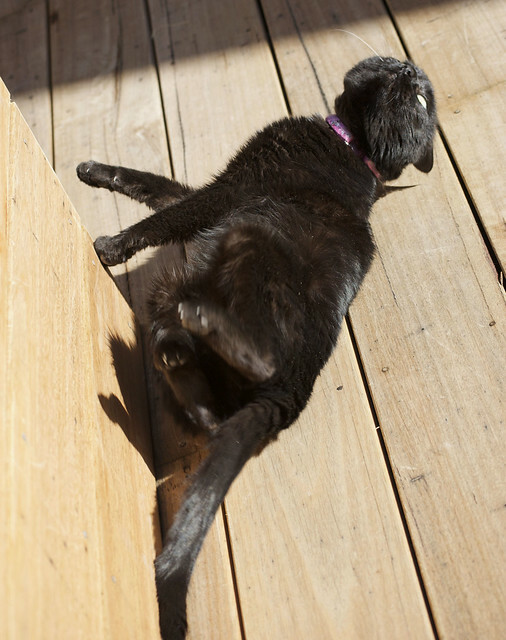 But on a nice warm day, there is nothing better than rolling around on the deck getting the sun on your furs, and plotting the demise of those annoying birds. 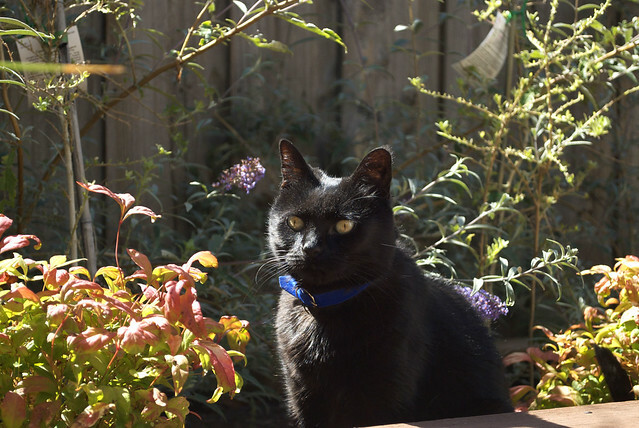 Mum really likes this photo of me, she says I look very pensive. What do you all think? 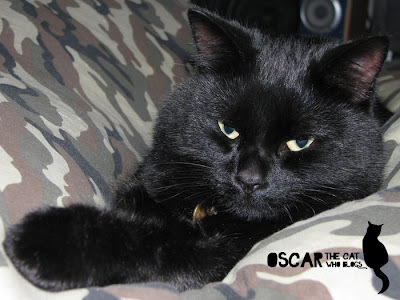 Today I'd like to introduce you to my friend Oscar. 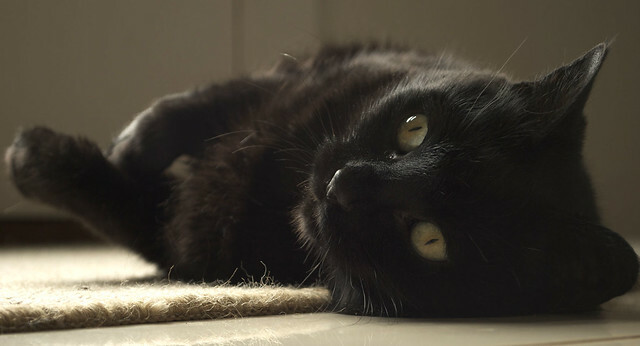 He is a black cat. 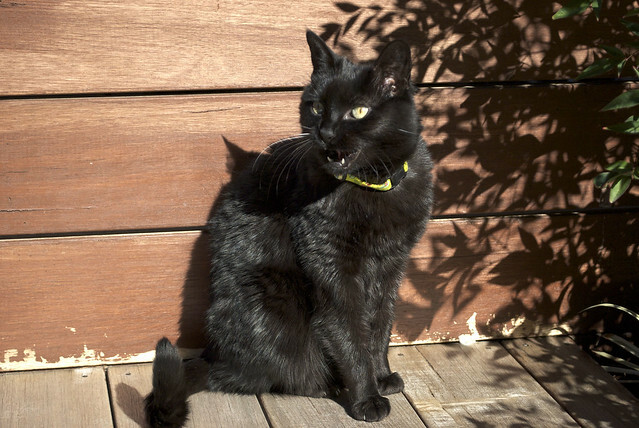 He is not to be confused with my other friend Oscar the black cat; this Oscar lives in New Zealand. Could you all please go over and say hello to Oscar if you don't already know him? Tell him I sent you. Thanks! We have had exactly one day of sun this week and this is it! I am getting a bit sick of winter; can someone please send me spring? I could use a bit of a dry patch, everything around here is soggy. Now that it is Tuesday I am much more awake. So I am sitting outside calling to all the evil birds that hang around my back yard, trying to get them to come and play with me. I only want them to come down here for a minute. 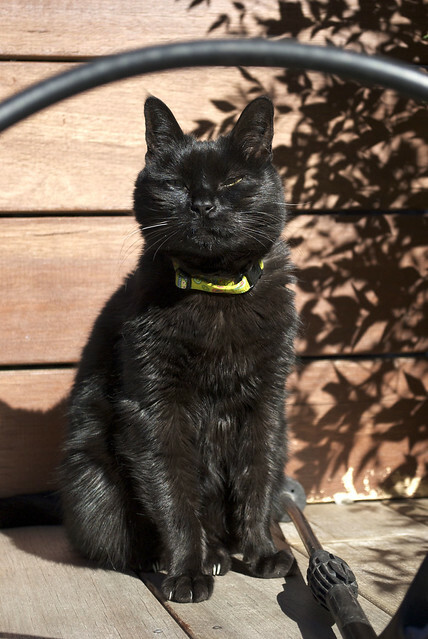 I think that really, it's just too much to expect a black cat to be awake on a Monday morning. 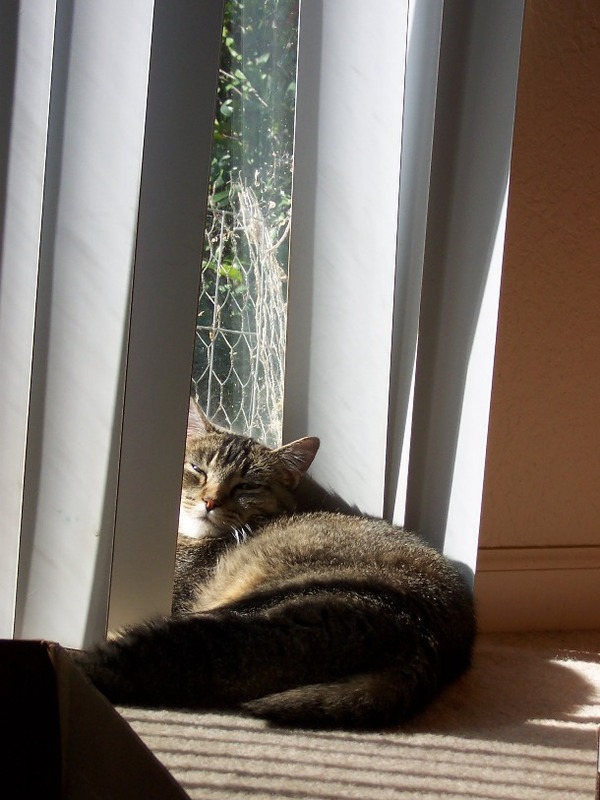 So I'll just stay here in my sunspot until it's time to get up. No, it's not time to get up yet. 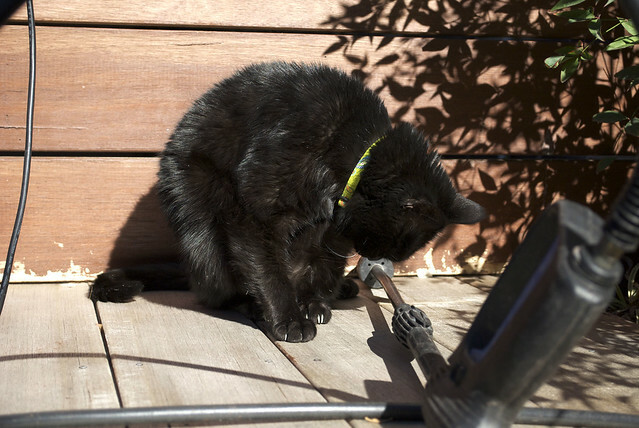 After the excitement of last weekend, I am not going anywhere near the wet part of the deck. 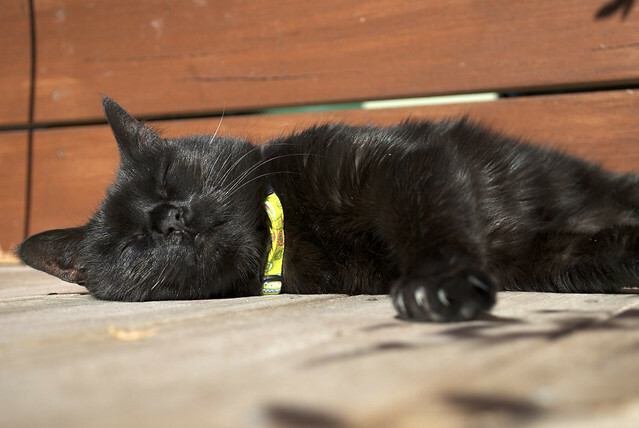 So today I'm spending some time on the already stripped part of the deck and soaking up some rays. Who wants to come over? At the moment, dad is working on stripping our back deck. 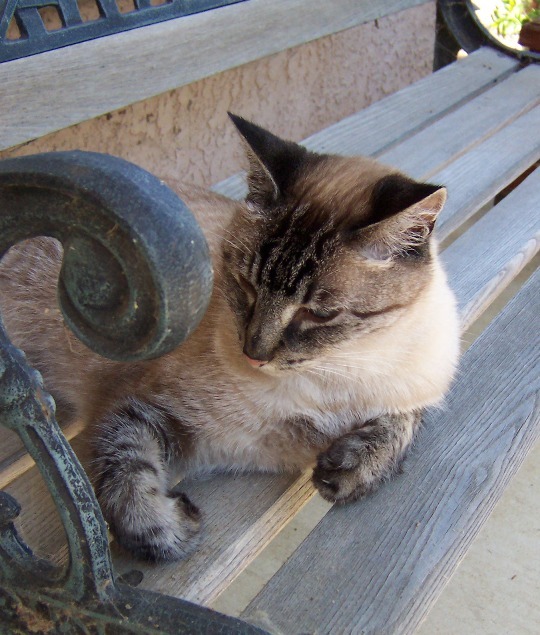 He uses paint stripper and usually I am not allowed outside to help him. 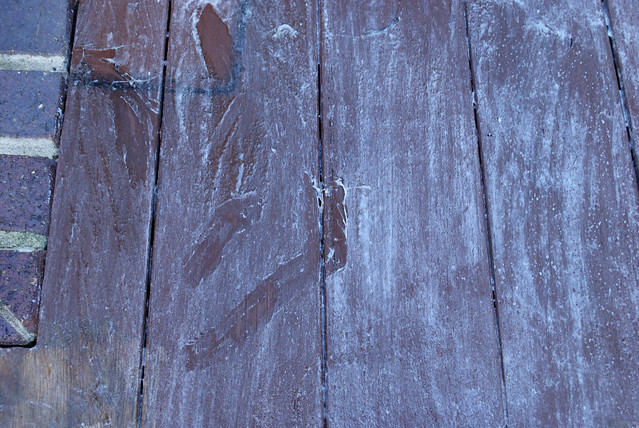 Last Saturday, he did not realise I was already outside when he went out to strip the next section, and had just coated the deck with paint stripper when I made a break for it and sprinted into the house. Well, I tried to run really fast but as you can see I got into a bit of trouble. Dad chased me into the house and made mum hold me really tight and I have to have a BATH! I yelled the whole time. Dad said he had to get all the paint stripper off my paws and tail, and my pantaloons, so that my skin didn't get burned, and so I didn't lick my paws and get sick. I tell you pups and kitties, I was not happy. 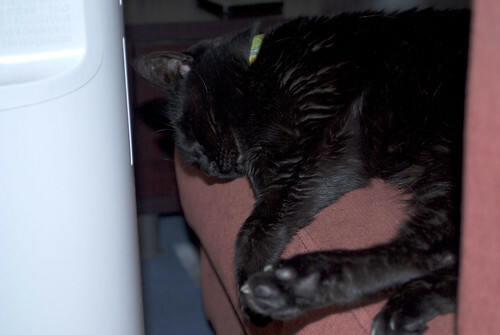 Lucky I have my new toasty heated bed to make me feel better. Last week, mum came home with the best present in the whole entire universe for me! See the cord in the bottom left corner of the photo? 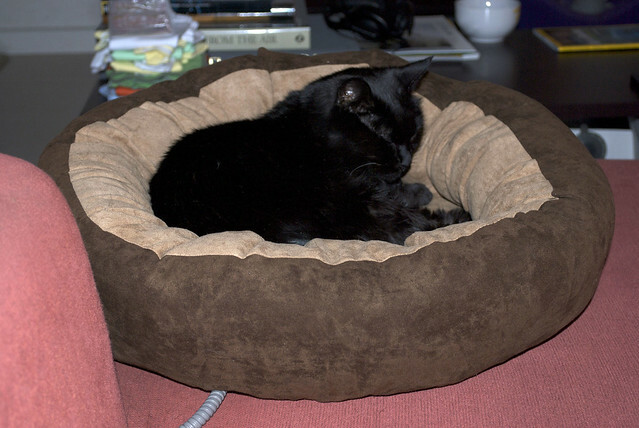 That means that this is a heated pet bed and now I can be toasty ALL the time! It's so exciting. At first I wouldn't sit in it (I don't really like new things), but then on Saturday night dad held me in it and I could feel my paws getting all toasty, so I lay down and got toasty all over. I am never getting out of this bed. I haven't seen any of you at the front door waiting to be let in yet. But Ramadan started this week and since we have a mosque on the corner of our street, there are LOTS of people wandering around at all hours and I have to keep an eye on them. This is the high pressure water sprayer that dad is using to strip our back deck. You can see that the part I am sitting on is a different colour to the wall behind me. I have to check on the sprayer to make sure it meets Huffle Mawson standards. Mind you, I don't stick around when it is on; I don't actually want to get wet or anything. A few weeks ago my friend Sparkle emailed me and asked if I would be interested in reading an advance copy of her new book and doing a review. Of course I said yes! So last week my copy arrived. 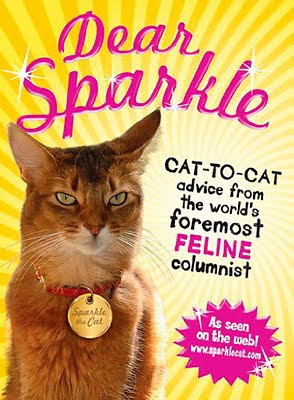 Dear Sparkle: cat-to-cat advice from the world's foremost feline columnist is a very entertaining and informative read. 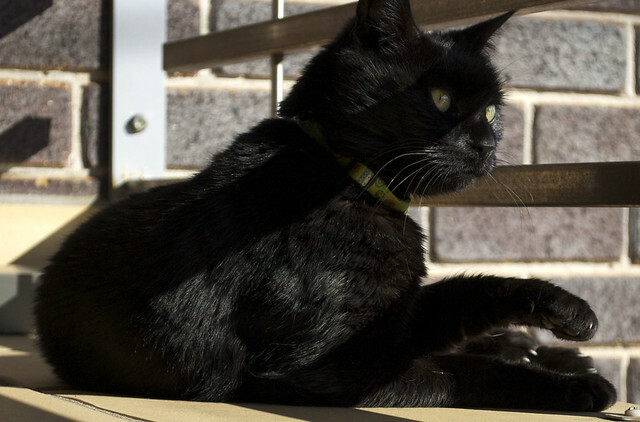 Cats from all over the world have submitted their problems and Sparkle gives out some very good advice. Have your humans tortured you mature kitties by bringing home a kitten? Sparkle has the perfect solution. Not happy with the litter provided for you? Sparkle knows what you can do to get it changed. 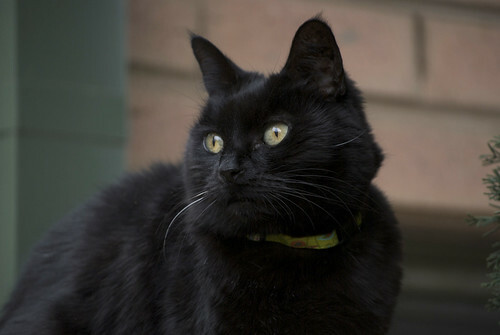 The book is littered with "Sparkle Says" quotes; these are very informative and will provide cats with many wonderful suggestions to remind their humans that actually, we are in charge. I give this book four paws up! If you click on the picture up there it will take you to Amazon where you can get your very own copy. 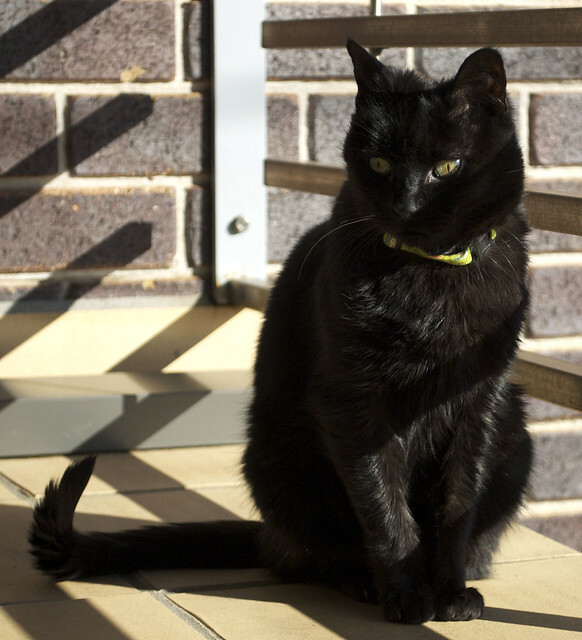 Did you know that today is World Cat Day? I am not sure what that means but I'm pretty certain it means I should get extra ham and maybe even some prawns today. 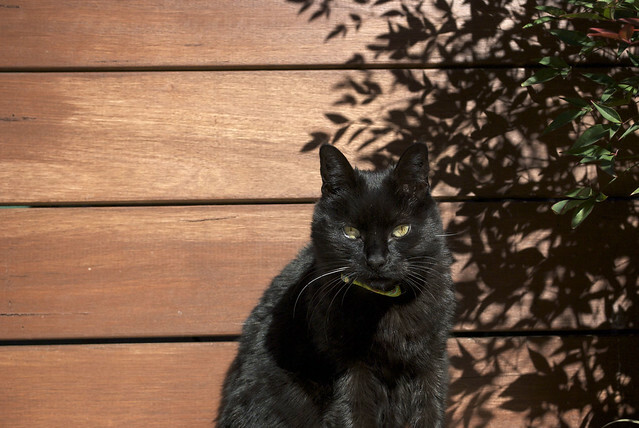 Happy World Cat Day to everyone! Tune in tomorrow to read my review of Sparkle The Designer Cat's new book. My deck is not really black and white or grey like this. Mum was being a smarty-pants with Photoshop. I think she should just leave my photos alone. Today I'd like you all to meet my friends Pip, Smidgen and Minnie. 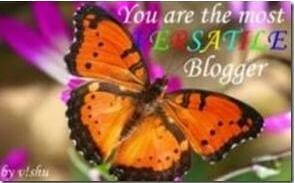 They have been blogging a little while and if you don't know them, please go over and say hello! They're from California. Tell 'em Huffle Mawson sent you! 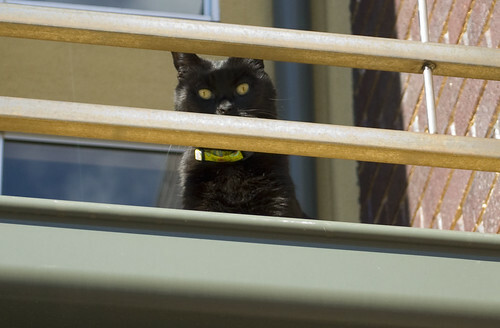 Last week when we had some nice warm weather I let the pupparazzi take a few photos of me on the balcony. You have to keep them happy sometimes. There was HAIL the other day. Hail. Something is wrong with this picture. Mum cannot understand why I like to sit up here on the fence and watch the world go by. There is not much to see, only the neighbour's back yard. But she doesn't understand that this is where the birds are, and by sitting up here I am much closer to catching one. 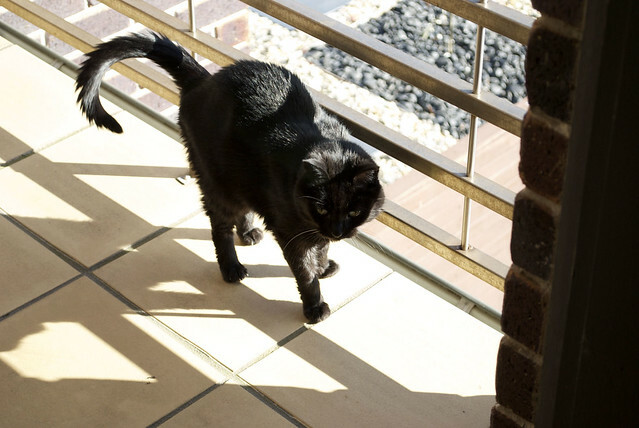 When I am allowed out on the balcony during the summer, this is what visitors to our house are greeted with. If I don't like the look of the visitors, I tell mum not to let them in. All of you would be allowed in immediately, of course. The nice people at Awarding the Web have given me this award as one of the top cat bloggers for 2010. Isn't that wonderful? I see quite a few of my friends have already received this, which is good to see, because in my opinion we are all top cat bloggers!